Scientists at DESY have achieved a milestone towards the usability of novel, plasma-based particle accelerators. Using the electron beam of the PITZ accelerator, the Photo Injector Test facility at DESY&apos;s Zeuthen site, DESY physicist Frank Stephan and his group, as part of the LAOLA collaboration, accelerated electrons in a plasma wake with an enhanced ratio between acceleration of the witness and deceleration of the driver beam. This so-called transformer ratio defines the achievable energy gain in such a plasma accelerator. Their results are now being published in the journal Physical Review Letters. Plasma-based particle acceleration is a novel accelerator technology which utilizes the possibility to achieve accelerating field strengths in a plasma which exceed those of conventional accelerators by three orders of magnitude. In the case of the Plasma Wakefield Acceleration scheme, a pair of two electron bunches are shot into an ionized gas (plasma) where the first, highly energetic “driver”-bunch drives a plasma wake. The second, “witness” bunch, which trails the first one with about five picoseconds (millionth of a millionth second) delay, is accelerated in the plasma wake like a surfer who rides the wake of a boat. The electrons which drive the plasma wake are being decelerated in the process and act as the energy source for the acceleration. The ratio between acceleration and deceleration is the above-mentioned transformer ratio. A high transformer ratio corresponds to a boat, that slides lightly through the water but creates a high wake at its stern. For the electron beams that have been used in plasma wakefield experiments so far, the transformer ratio is limited to 2. The experiments at PITZ aimed at breaking this limit, which was possible by using the specially formed electron bunches that are available at PITZ. 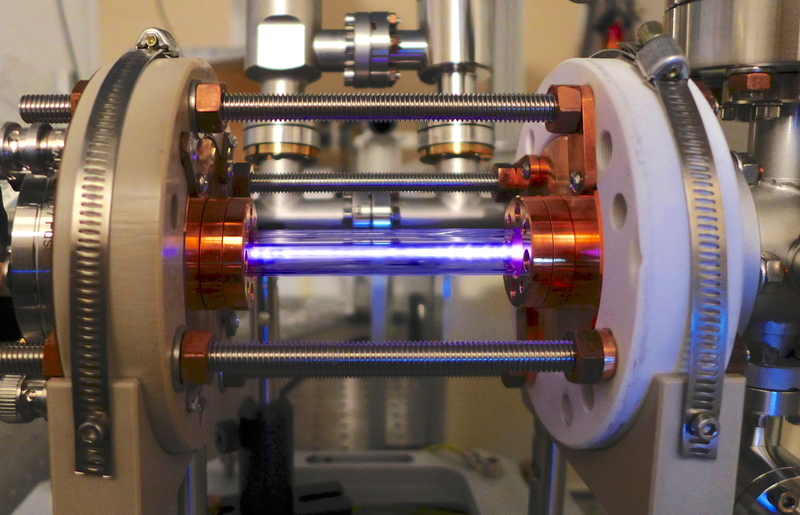 Using the flexible photocathode laser of the facility, the researchers were able to investigate plasma acceleration by asymmetric, triangularly shaped driver bunches for the first time. With this crucial improvement, a transformer ratio of 4.6 was measured, exceeding previous experiments significantly. Especially the high achievable accelerating field strength makes plasma acceleration one of the most promising candidates for novel particle accelerators. Increasing the field strength allows to shrink the acceleration length at constant acceleration energy, which would reduce the cost for building and operating such a future facility. The studies performed at PITZ, could allow to also shrink the energy of the required conventional driver beam accelerator and reduce the costs further. 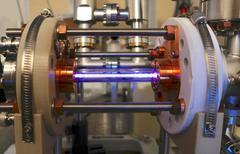 Today, only few facilities in the world are capable of producing the flexible electron beams needed for this. Other crucial assets of the research accelerator PITZ besides its bunch shaping capabilities are the various diagnostics to accurately measure the electron beams and the possibility to supply sufficient beam time for such accelerator experiments. In addition to increasing the relatively moderate acceleration field strength of currently 3.6 megavolts per metre (MV/m), the scientists will focus on improving the bunch shaping flexibility in further studies.